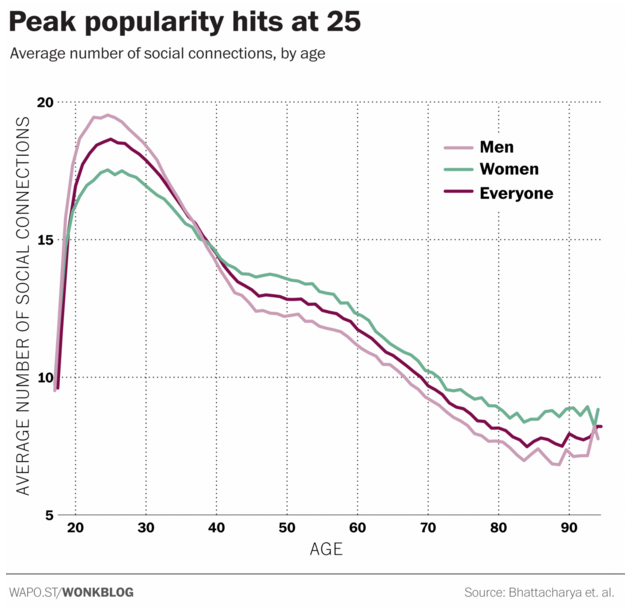 You're never more popular than you are at age 25. Or at least, that's the age when we tend to have the most people in our real-life social networks, according to research recently published in the journal Royal Society Open Science . Researchers analyzed one full year's worth of cell phone call records for 3.2 million customers of a European telecom company. They found that the average number of people a person calls (or is called by) in a given month peaks around age 25. After that, your number of regular social connections nosedives until age 45 or so. Take a look. "One important conclusion we can draw is that the average number of contacts is quite modest: in most cases, people focus their (phone-based) social effort each month on around 15 people," the researchers write. They note that this corresponds to the number of friends and family members people typically have face-to-face interactions with in a given month. "Thus, we provide some evidence that the use of mobile phone technology does not change our social world," they write. "It also provides further indirect evidence for the fact that we use the phone to contact those who are emotionally closest to us rather than simply those who live furthest away." Recent years have seen the rise of a hot-take industry dedicated to the notion that cell phones are making us less social or killing face-to-face interactions or otherwise radically altering our lives , usually for the worse . But this study doesn't find a whole lot of evidence for any of that. When viewed through their cell phone records, peoples lives tend to follow a particular narrative arc: a period of "social promiscuity" and exploding social contacts in the late teens and early twenties, followed by a rapid narrowing of the social sphere from the late twenties through early middle age as people marry, have kids, and otherwise settle down.